Use it or lose it. The good thing about getting a cert with a 3-year expiration period is that I don't have to worry about it for 3 years. The bad thing is that I forget how in the world I did it last time. I waited until the last minute (or last three hours) to renew a cert today for an Azure web app. A call to GoDaddy support led to a statement saying that because Microsoft hasn't provided them with documentation, they can't provide their customers with assistance due to potential liability issues. Of course, there are plenty of blog posts written about this in various forms, but even an Azure post wasn't quite helpful for my lack of knowledge in this area. But this one was. So glad people document things like this. When I start a new project, particularly when doing a POC, I'll often grab something I've done in the past that is similar and begin to tweak from there. But as POCs tend to evolve, problems occur when my assumptions remain the same. That "tested with..." disclaimer tag that came across from the borrowed project just won't cut it as is. A good reminder to actually test and not assume. I'm glad I have a co-worker who has a knack for breaking things before customers do. This morning I read an older but popular blog post on the duct tape programmer. It is colorful commentary that I've read it before and provides a good reminder on prioritization and getting things done. I'm not here to write code; I'm here to create value for this organization. This mindset isn't about making a choice between value-added functionality wrapped in that lovely VB6 gray on the one hand (we have too many of those still in use, unfortunately), and useless but pleasant looking UIs on the other. The development tools and platforms today don't present that one-or-the-other choice. Conceiving, creating and putting into the hands of our business partners the tools that make a difference is paramount. And if it takes duct tape at times to help us do that, so be it. Late last year my team delivered a Windows 8.1 modern app to our outside sales force equipped with ThinkPad 10 tablets. There were bugs to be worked out, of course, and we've still got plenty to fix. But one problem has been truly discouraging given our inability to reproduce it. From time to time, we'd get reports from sales that the top third of screens in the app would simply disappear, leaving just the background of the screen. The weird thing was that the controls that disappeared were actually still interactive. If you knew where they were, you could tap them and do things. But a horrible user experience, especially when you're in front of a customer. We even saw this problem ourselves on occasion but couldn't reproduce it. The only way to get around it was to close the app and reopen it. Over time, we came to see that this problem generally occurred after the device had come out of sleep mode. One of our more observant sales reps pointed this out and stated that if he manually closed the app after each customer encounter, the next time he woke the device and used the app he rarely had the issue. "I can re-create the problem by going to task manager and creating a dump file for the running app. After I do this twice and resume the app, the two text blocks disappear." He also described how the use of images was related to this problem. Sure enough, we were using an image for our app's background. We removed the background image and instead used a simple Brush. At that point, we could no longer reproduce the issue using the steps above -- problem resolved. I'm still not sure why the problem occurred in the first place. Possibly related to the lower memory devices (2GB)? Or maybe just something we were doing wrong in the app when trying to use a background image? Earlier this year a great opportunity came my way: the proof of concept WinRT app created to showcase the possibilities for our sales force was received favorably and my team was given the green light to make it a reality. We started preliminary design work in June, finished the first release in October, and we're currently wrapping up the second release that includes order entry capabilities. Distribute new ThinkPad 10 devices running Win 8.1 Pro with WWAN service. Convert the reps to Office 365 in the process. Deploy an easy-to-use, touch-first sales intelligence app that provides far more actionable information about our customers than ever before available in the field. Daily engagement list at the rep's fingertips for easy access to customer information. Graphical sales trends, filterable by product segments. Recent history of quotes and orders for a rep's customer base. Rich customer profile info, including sales history and trends, AR and aging data, contacts, quote and order history, even recent history of customer phone interactions with our inside sales. Real-time inventory and pricing data on all products. Lenovo's ThinkPad 10 device running Win 8.1 Pro, joined to the domain. Designed as an occasionally-connected app using SQLite for caching data locally, with a variable refresh schedule so that more static data is cached for longer, while volatile data is refreshed more frequently. CSLA.NET framework for encapsulating all business logic, not to mention the built-in plumbing necessary to support our 4-tier architecture. RayGun error and crash reporting service. SCCM for managing deployment, as this is not distributed through the Windows Store. The ThinkPad 10 device replaces the sales reps' existing desktops and/or laptops. Given that it runs Win 8.1 Pro, we've even loaded some of our legacy apps onto the device, while other legacy apps are accessed via VMWare's VM View remote solution. It's going to be an adjustment for our sales reps...time will tell. This project has certainly helped push our small development group further along to thinking about application design in a more modern way, using newer technologies, frameworks and toolkits. The benefits of the CSLA .NET framework show yet again that our investment in learning and adopting the framework has proven valuable, as we can easily leverage our knowledge to build maintainable applications with lower cost. RayGun, if you've not checked it out, is quite handy. It allows us to be notified of errors encountered by our distributed users before our help desk even hears about it. It pays to read Hanselman. This app provides a modern experience that parallels our 20 year old legacy order entry app (still VB6 to this day). It has been a great exercise for our IT group and users to be challenged to think outside of the way-we've-always-done-it box. Old paradigms didn't work with a touch-first app, so creativity was required. At the same time, 20 years of an actively developed application reveal that a lot of thought was put in to it by a lot of smart people during that time. Made sure Anonymous was disabled, Windows Authentication was enabled. Also added the app to the Trusted Sites just to make sure. I realized that setting Windows Authentication in IIS causes the current user’s identity to be used when the site’s files are accessed on disk. In the case of the users who were prompted, they weren’t in an AD group that had permission to the root directory. But granting access to the root folder isn’t an option for security reasons, especially if you’re storing a database connection string in the web.config file. Thanks to this post, I learned IIS 7.5 has a setting that forces IIS to utilize another identity for disk access even when Windows Authentication is utilized. The key is to set the authenticatedUserOverride option to use the “UseWorkerProcessUser” value. Of course, make sure the worker process has permissions to the app's directory. User.Identity.Name no longer works once the change is made. To compensate, you can use the altnerative: Request["LOGON_USER"]. 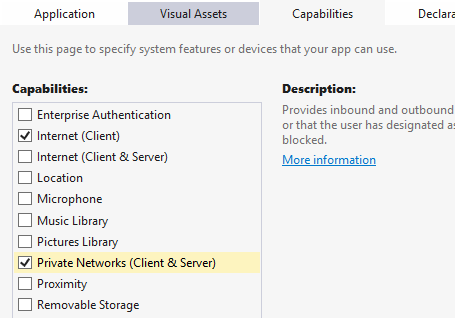 Scenario: WinRT app interacting with CSLA business objects hosted in a WCF service on an app server in the corporate domain. "An attempt was made to access a socket in a way forbidden by its access permissions." But everything was set up the same way my recent MVC projects have been set up. All permissions in IIS were correct. The problem, it turns out, was not with IIS or the remote data portal. This article pointed to the necessity of declaring the right capabilities in the WinRT app's package manifest. The opinions expressed here are my own and do not represent the views of my employer.